This elegant shaped Nicolas executive home office group comes in a beautiful two-tone finish and it features amazing detailed carvings throughout the pieces. This collection offers large oval executive desk, drawers feature full extension drawer glides and are adorned with decorative hardware. 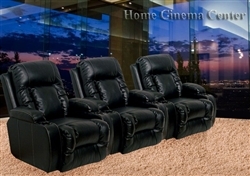 This amazing Geneva Leather Theater Collection by Catnapper is sure to enhance any home theater experience. These chairs are one of the most comfortable chairs on the market and can be made in many configurations. Available in manual or electric power recline, with optional wedges, and unlimited seating options.